NATO and women - words that do not necessarily make a natural connection in peoples' minds. It is either men in uniform or in dark suits, the diplomats' preferred outfit, that populate NATO's corridors and committee rooms and, more importantly, take decisions. Still, you must look hard to find women at NATO's senior political level: the French Ambassador is an exception: being the only woman at the table of the North-Atlantic Council, Mme Andreani can be rather easily spotted. The vast majority of senior posts in NATO's International Staff, however, are still held by men. Only two of the 19 civilian top posts are currently occupied by women. Up to now, the Alliance has never appointed a senior female envoy or special representative, nor a woman Secretary General or Deputy Secretary General. Given the number of Allies which have women Foreign and Defence Ministers, the latter is somewhat surprising. The governments of Croatia and Iceland and are even run by woman Prime Ministers and Germany has its female Chancellor. Yet a closer look tells a different, more encouraging story. During the past years more and more women have found their professional way into NATO. Although still a minority, they are doing excellent jobs across NATO's political and military agenda. They deal with defence policies and procurement issues, they act as political advisors to NATO's Senior Representative in Kabul and run the Science for Peace and Security Programme. They prepare NATO's committee meetings, the Secretary General's checklists and analyses on NATO's operations. In short, women are adding significantly to NATO's workforce, both inside Headquarters and in the field. NATO's gender and diversity policy, that the Allies adopted in 2002, has certainly helped women to break the ceiling in a field traditionally dominated by men. In the past years the number of women applying for NATO jobs has steadily grown. Meanwhile a NATO Office on Gender Perspective works on the implementation of a specific Action Plan and a NATO Military Committee on Gender Perspectives facilitates the exchange of gender-related policies among NATO and Partner nations. More importantly, NATO has begun to make a serious effort to contribute to the implementation of the United Nations Security Council Resolution (UNSCR) 1325 on Women, Peace and Security. Adopted on 31 October 2000, Resolution 1325 proposes an ambitious, wide-ranging set of actions. It calls upon states and international organisations to actively protect women and children from violence in armed conflicts, prosecute sexual war crimes, mainstream a gender perspective into peacekeeping operations, improve specialised training and support local women's peace initiatives. In addition, the resolution urges Member States to ensure increased participation of women in all efforts for the maintenance and promotion of peace and security, expand the role of women at all decision-making levels in national, regional and international institutions and propose more women candidates to become UN special representatives and envoys. It is extremely encouraging that the NATO Secretary General, Anders Fogh Rasmussen, has decided to commit himself to this issue. Addressing an international gathering of 400 mostly female security professionals in Brussels at the end of January, he acknowledged the important role women can and should play in conflict prevention, peace negotiations, peacekeeping operations and on the international and national decision-making level. His message was echoed by Margot Wallström, the newly appointed UN Special Representative tasked with combating sexual violence against women and children in conflicts, former U.S. Secretary of State Madeleine Albright and Maria Teresa Fernandez la la Vega, Spain's First Vice-President, in stressing that implementing Resolution 1325 is a matter of necessity rather than choice. So far the NATO Allies have started to tackle Resolution 1325 primarily from the military end: they approved concrete guidelines for the integration of gender issues into all NATO planning and operations, including a Code of Behaviour for military personnel. They created dedicated posts for gender advisors to support ISAF commanders in Afghanistan and are discussing how to enhance training and co-operation on gender issues in concert with the European Union, UN and other international organisations. In addition, many of the Allies pursue national Action Plans to strengthen the implementation of Resolution 1325. Finally, NATO's policy on combating human trafficking also helps to protect women, through the definition of guidelines of behaviour and training for civilian and military personnel deployed in NATO operations. This is all good news but now that the Secretary General has added his personal weight, a more ambitious course of action may be within reach. In Afghanistan and other operational areas NATO could engage local women groups more systematically and support their competencies building. Connecting NATO more closely with global womens' networks would also be very useful. There are plenty of good initiatives and programmes aimed at empowering women's participation in peace and security issues. Partnering, for example, with the Club of Madrid, the Hunt Foundation or the Global Women's Group would certainly be beneficial for the Alliance's contribution to the Comprehensive Approach. Fostering efforts to raise more interest in transatlantic security issues among the generation of young women, both in Member and Partner countries, is already one of NATO's top communication priorities for the future. Just a couple of weeks ago, the Public Diplomacy Division invited a group of young female defence specialists to Brussels and there are more outreach programme for women in the pipeline. Just like their counterparts in the EU, NATO's female Defence and Foreign Ministers may also want to meet occasionally and discuss how their political influence could help to boost the implementation of Resolution 1325. So could, by the way, the female Ambassadors from Allied and Partner countries in Brussels. Last but not least it would also be an important signal if the Organisation reinforced its efforts to train and mentor NATO's women more systematically with the aim to have more senior female role models in the near future. As we approach the 10th anniversary of the Resolution 1325 later this year there will be many opportunities for governments, international organisations, NGOs and others to reflect upon what more could be done to implement this groundbreaking resolution across the board. Thanks to NATO Secretary General Rasmussen, NATO's contribution to 1325 will remain on top of the Allies' agenda. This is great news for all, including NATO's women. Dr. Stefanie Babst is the NATO Deputy Assistant Secretary General for Public Diplomacy. 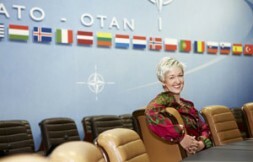 She is one of NATO's most senior women in the International Secretariat. The views expressed in this article are solely her personal ones and do not represent an official NATO position.